A whole generation of young women has been and is, as we live and breathe, being spurred towards the field of forensic science, which is conspicuous among science and science related fields for one demographic reality — it's dominated by women, not men. 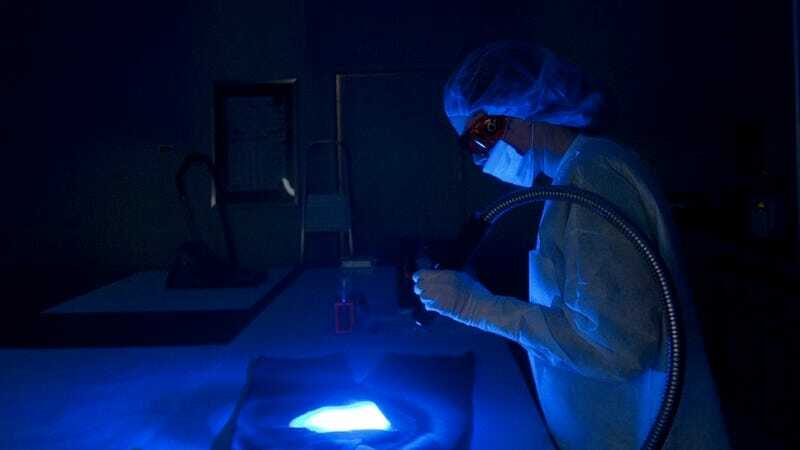 The Washington Post reports that women, possessed of a keen interest in science and inspired by police procedurals such as CSI and Bones, are entering the burgeoning field of forensic science faster than men, and are, as a result, capitalizing on a growing need among federal and state law enforcement agencies for forensic scientists. The field is relatively new to academia, with the earliest and most famous program starting in 1946 at the Michigan State University. Until the 1990s, most forensic scientists were funneled into a law enforcement agency from other fields, and then trained in-house. As the demand for forensic scientists has increased, however, so too has the proliferation of university programs. William Whildin, who worked three decades as an investigator for the Fairfax County Police Department and the Virginia medical examiner's office, started a forensic science program at GMU with the hope of advancing the field by specially training new scientists. In 2009, his program catered to just three students, but now, 200 are enrolled in one of the two graduate programs, and another hundred are pursuing undergraduate degrees. Classes include forensic toxicology, forensic chemistry, criminal law, DNA, anthropology, crime scene analysis and how to properly execute a "find the identity of this mummified body" montage, à la a diligent Pauly Perrette, or a socially inept Emily Deschanel. Students who successfully complete forensic science programs like the one at GMU can expect to enter a field that is ravenous for new talent — the Bureau of Labor and Statistics predicts that jobs for forensic science technicians will outpace average job growth, expanding by 19 percent over the remainder of the current decade. Entry-level salaries start around $30,000, though median salaries hover around $50,000, and can soar well past $80,000 especially if a candidate scores a sweet federal agency gig somewhere in the massive, glittering office park that is the Beltway (D.C.-Baltimore traffic is THE WORST thing ever and anyone who contends, "Nah, dude — SoCal traffic is way harsh," should imagine what sitting in traffic in a slush blizzard feels like). The really cool thing about forensic science, though, is that it's among the very few science fields that women overwhelmingly dominate. Whildin's GMU program is 90 percent female because, he explains, "Men tend to gravitate towards the gun-carrying jobs," because nothing says, "I'm a big, bad lawman" quite like waving a government-issue pistola at someone resisting arrest. Across our great and diverse nation, women still dominate the field, with a 2008 survey revealing that, of the 1,250 students enrolled in 22 graduate and undergraduate programs accredited by the American Academy of Forensic Sciences, 78 percent were women. Many of the women who enter the field attribute their strong interest in science to some influence in the media — some women credit procedurals like CSI, while others talk about being "transfixed" by cases like Jeffrey Dahmer's. The same way, for instance, that shows like Flash Gordon or Lost in Space inspired or influenced a whole generation of young male astrophysicists (I mean, probably influenced), sordid crime sagas are influencing a whole generation of young women to help locate, exhume, and identify decomposing human remains. Science, you see, is a wonderful thing.